Layer ingredients. Spray an oven safe dish that will fit inside your Instant Pot with non-stick cooking spray. I used my Fat Daddios 7 inch by 3 inch cake pan*. Layer the hashbrowns in the bottom of the pan. Lightly salt and pepper the hashbrowns. Then layer on the spinach, bacon bits and finally the cheddar. Pour the egg mixture over the top of everything. Prepare to cook. Pour 1 cup of water in the bottom of your Instant Pot. Place a trivet* in the bottom of the pot. Cover your casserole pan loosely with foil. Use a foil sling or silicone sling to lower the pan into the Instant Pot, on top of the trivet. Pressure cook. 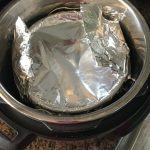 Cover the Instant Pot and secure the lid. Make sure valve is set to sealing. Set the manual/pressure cook button to 22 minutes on high pressure. Let the pressure release naturally for 10 minutes and then move the valve to venting. Serve. Open the pot and carefully use the sling to remove the pan. Remove the foil. Cut the casserole and serve. 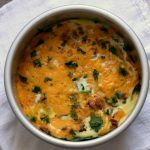 If you prefer you can stick the casserole under your oven’s broiler for a couple minutes.